OSWEGO – In honor of the 100th Anniversary of the end of World War I this November, Oswego Mayor Billy Barlow has announced an initiative to clean and restore the many war memorial monuments throughout the city in several parks. The initiative has already started with the Oak Hill Park World War I monument and the World War I memorial bench in Franklin Square receiving attention last week. Mayor Barlow has directed the Oswego Department of Public Works to focus on improving these monuments to recognize the service and sacrifice made by members of the Oswego community through military service. City of Oswego Historian Mark Slosek thanked Mayor Barlow for his commitment to improve Oswego’s memorial monuments and says it will add to the already special occasion of remembering World War I on the 100th anniversary. “It is only natural that the citizens of Oswego set aside public space to honor Oswegonians who sacrificed so much for the liberties that we enjoy today. Parks are the heart of our community. Taking pride in their upkeep not only respects those listed on our monuments but also attracts visitors who will acknowledge their dedicated service,” Slosek said. Memorial monuments exist in several city parks including Washington Park with a Civil War Monument dated 1932, East Linear Park has a tribute to the War of 1812, Oak Hill Park contains World War I and World War II monuments, American Legion Park has a World War I monument, and Franklin Square with a World War I memorial bench. 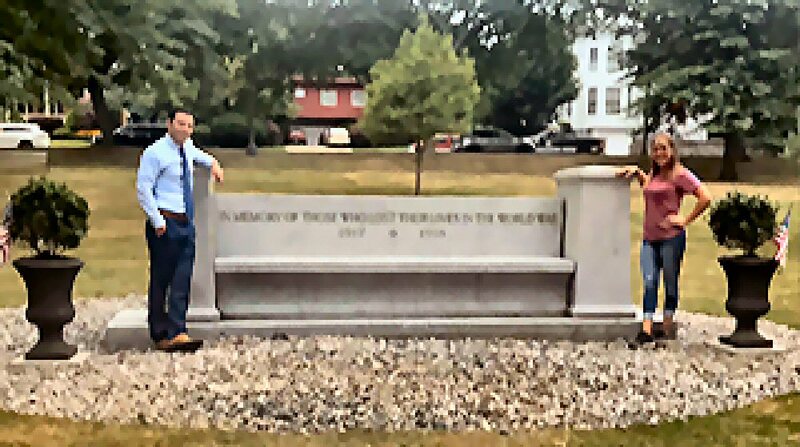 Since The Great War to End All Wars seems to be ‘forgotten’ in the HS curriculum across the nation, I think the most kids who sit on the lovely bench in West Park may not understand how horrible this war was. How it changed the WORLD, not just our nation or Europe. Many servicemen returned home so damaged they were unable to provide for their families, but since there was not Department of Social Services back then…the struggle was horrendous for families and even our community. The War to End All Wars, of course, was not the war that ended war, but begat an even more horrible war (with even more casualties and THEIR families). Without these reminders, we, as a nation will continue to foster hatred and misunderstanding(s) with other nations (we should fear what the next war might entail in the way of weaponry). So, I personally thank Mayor Barlow (ironically our youngest mayor) for truly understanding the necessity of PRESERVING these monuments. The Mayor seems to be doing many good things for Oswego, and this is certainly one of them as a prime example. As I recall, another “forgotton” piece of Oswego history also once existed in very close proximity to this very monument, being the original Presbyterian church built in 1825. Montcalm Park also has a lot of interesting history to it as well. Parks are one of the most important things any city can have, and preserving and maintaining them is worth every cent as I see it.